Chloramines are disinfectants added to drinking water. They are formed when ammonia is added to chlorine to treat drinking water. Chloramines make it so water has longer lasting treatment. This ensures the water is still safe to drink when it gets to your home, and isn’t harmful to your body. Chloramines are closely monitored and regulated. Water containing chloramines meet EPA standards that make it safe to drink, cook, bathe, and use for other things around your home. Many municipalities add ammonia to drinking water to change the chemistry of the chlorine to be chloramines. They are doing this for two reasons. One is in recognition of scientific studies that suggest chlorine itself is a carcinogenic. This leads to the other reason for adding ammonia to the water. They want to change the chlorine from being a carcinogenic to being a disinfectant. Studies done in 2007 indicate disinfection byproducts created from the use of chloramines are even more toxic that those of chlorine. Fluoride in your water possesses the risk of ingesting too much. Fluoride can be a great thing in normal doses but too much and you are in trouble. Fluoride naturally occurs in water due to it getting in by traveling through the ground. 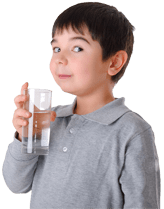 Your drinking water is also tested for fluoride and there is an EPA Standard as to how much can be in your water. Some states may place higher guidelines on this as they see fit. Fluoride can be removed b distillation or reverse osmosis.